It’s September and something scary is happening. We don’t mean next month’s Halloween season – it’s 2019 coming up fast. Investments that have been considered for 2018 have likely been pushed aside. However, after you take the time to evaluate your productivity this past year, ask yourself – can you afford to keep putting aside necessary shop floor upgrades? The most important question you should ask yourself is this: do I know my machine utilization rates? Implementing machine monitoring software will help you obtain this crucial information, plus three other benefits. This system can integrate with other software to help optimize machine capacity. ERP systems are a great fit with machine monitoring, for example. Also, CMMS systems paired with OEE monitoring helps to provide a more realistic PM schedule. Actual run times on your machines are monitored and the data feeds into to the CMMS to create an accurate PM schedule. For manufacturers without a CMMS, a simple spreadsheet with PMs to complete sometimes is enough. The software also integrates with protocols such as MTConnect and OPC UA to make shop floor data more universally available. Machine monitoring is not just for CNC machines. Manufacturers with autoclaves, manual machines, press brakes, PLC-driven machines, and more varieties can monitor their productivity. Those in the fabrication and moldmaking industries can benefit heavily from utilization monitoring. The software is also not limited to looking at shop floor monitors or your desktop PC on location – notifications on the go via text alerts, emails, or viewing dashboards via a mobile device/tablet are all possible. Machine monitoring helps operators working at machines convey important information to those not working on the shop floor. Via data entry screens and tablets at the machines, machinists can enter notes and let back office employees know reasons that the machines are down. It also helps with machine maintenance – since there are notes on what causes downtime for machines, less machine repairs are anticipated and reasons for planned downtime, such as material needed or coolant change, can allow employees to map out a more streamlined process. The bottom line – machine monitoring is not only a method for knowing machine utilization, nor is it only for CNC machinery. Machines issues that need attention can be communicated in an easily understandable manner. Equipment that needs attention can become more productive. Scytec has launched a new E-Learning website for their machine monitoring system DataXchange. 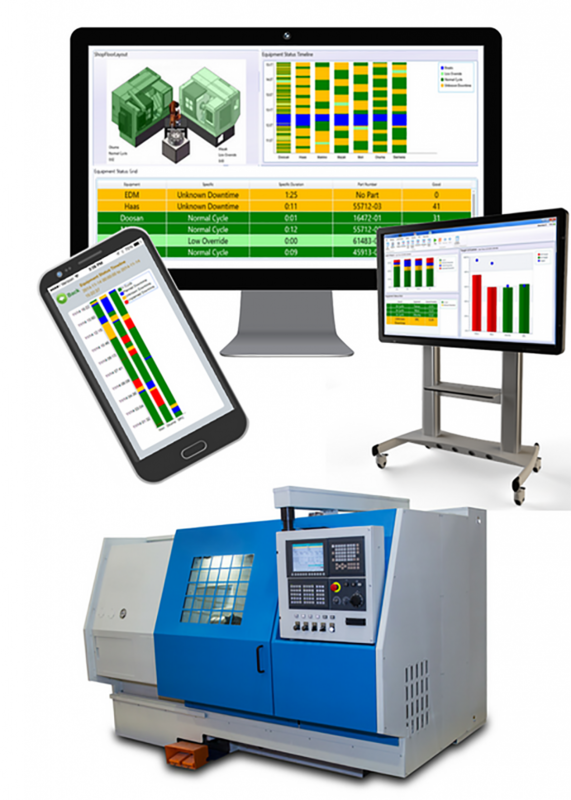 Knowing how to get the most benefits from the machine utilization tracking software is now easier than ever, with the educational courses available for all shop personnel. E-Learning is a series of online courses that DataXchange users can take at their own pace, at any time. Topics covered include: configuring reporting options, shift options, software installation, initial configuration, modifying existing machine data, system administration, and understanding the machine data collection sources. The learning modules are a combination of text and videos with a quiz at the end of each class. A subscription of DataXchange E-Learning is valid for 12 months. During that time, the user has unlimited access to the site and the ability to revisit courses they have finished, if a refresher is needed. New courses will be added frequently, so the 12-month investment will continue to provide added value with more opportunities to learn. Access to the site is controlled with a single customer login that can be shared with any employees of the shop floor that can benefits from the classes. In order to obtain the goals of lean manufacturing, overall equipment efficiency and increased machine capacity, the user needs to know the best ways to utilize DataXchange to make better shop floor decisions. With E-Learning, the user should be able to achieve the benefits of increased utilization and decreased downtime with proper use of the software. Contact Shop Floor Automations for an E-Learning quote today! Founded in 1998, SFA has delivered on their promise to thousands of customers with proven software from Scytec, Ascendant Technologies & Predator Software. They have automated thousands of manufacturing machines with hardware while partnering with numerous companies to increase shop floor efficiencies & profits. Call (877) 611-5825 or email for more information via info@shopfloorautomations.com. Previous articleREGO-FIX® Accepts Bitcoin as a New Payment Option Providing Additional Convenience for a Global Customer Base. Next articleTo Train or Not To Train?